The dimensions of metric ADP adapter sleeves are in accordance with ISO 2982-1:1995; except the bore diameter of metric sleeves for inch shafts.The dimensions of ADP adapter sleeves with inch dimensions are in accordance with ANSI/ABMA Std. 8.2-1991. 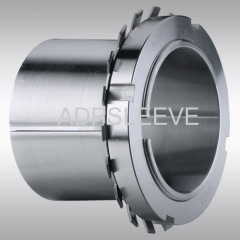 The bore diameter of metric ADP adapter sleeves is to tolerance JS9, the width to h15.The tolerances of ADP adapter sleeves with inch dimensions are in accordance with ANSI/ABMA Std. 8.2-1991. Metric ADP adapter sleeves up to size 40 have metric threads with 6g tolerances, according to ISO 965-3:1998. Larger adapter sleeves have metric trapezoidal threads with 7e tolerances, according to ISO 2903:1993.ADP adapter sleeves with inch dimensions up to and including size 64 (12 inch shaft diameter) have Unified Special Form threads (based on the old American National form, class 3 design). Larger sleeves have Acme Class 3G, General Purpose threads. 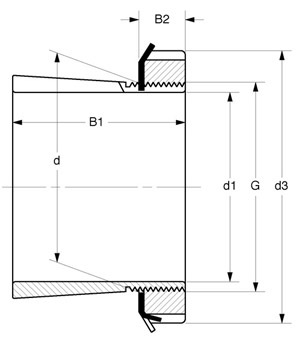 Generally, the form tolerances must be kept within narrow limits as the accuracy of form directly affects the running accuracy of the bearing. shafts should be to an h9 tolerance but the cylindricity should be to IT5/2 according to ISO 1101:2004.